WNYC reporter and author Matt Katz, left, and Star-Ledger editor Tom Moran describe Gov. Chris Christie’s national popularity and fall from grace. When Matt Katz began reporting on New Jersey’s controversial and colorful governor, Chris Christie, in 2011, he was covering Camden for the Philadelphia Inquirer. Now he is a radio reporter on WNYC in New York, but he has maintained a keen interest in the once-promising politician who longed to be president and came crashing down to bitter defeat by finishing next to last in the key New Hampshire Republican primary in early February. 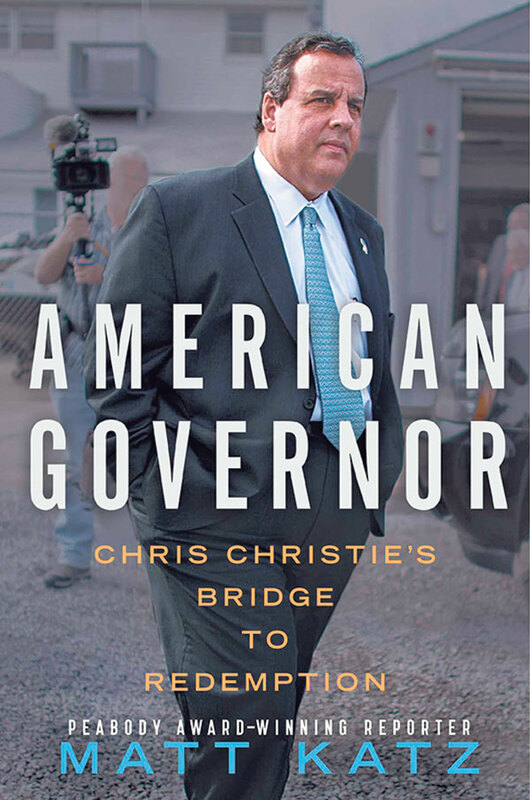 Katz has turned his fascination into American Governor: Chris Christie’s Bridge to Redemption, a book published in January by Simon & Schuster’s Threshold Editions. Standing beside Katz on the bima of Temple B’nai Abraham in Livingston on March 30 was the editorial page editor of The Star-Ledger, Tom Moran, another close observer of the governor. Their joint appearance — “Christie and Beyond: Unraveling the State of the Garden State” — was part of the synagogue’s Congregational Learning program. 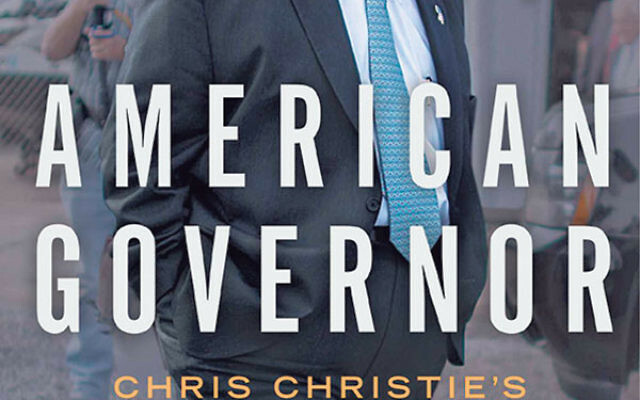 Though initially resistant to reporting on Christie, Katz told his audience of 200, “my editor appealed to my ego and said, ‘You are going to cover this guy differently. You are going to cover this guy everywhere he goes….’ I liked the idea of delving into one topic as deeply as possible,” he said. Within a year after taking office in 2010, Christie was being touted as a candidate for president against Barack Obama in 2012. “He was meeting with billionaires in New York City from Wall Street, and high-profile Republicans like Henry Kissinger [Richard Nixon’s secretary of state] were standing up and telling him how he needed to run for president, and they were going to back him no matter what. It was extraordinary,” said Katz. Katz ascribed some of Christie’s national success to a “taxpayer-funded political unit” that “would crunch election data” to find the most advantageous locations for his town hall meetings. Then “someone with a stage management degree,” according to Katz, would choreograph the setting for each appearance — often opting for a “theater-in-the-round” set-up — in churches, schools, and synagogues. “The governor didn’t always want a congenial experience,” said Katz. As a tactic to garner support from his audiences, he also “wanted a confrontation” with a teacher or other unionized public employee who was a target of his budget cuts. His video unit would record and post these moments on YouTube “before we even got back to the newsroom to file our stories,” Katz said. Those YouTube appearances attracted political media pundits like Don Imus, “who was asking Christie five months into his term if he was going to run for president” because “Christie didn’t seem like a normal politician,” said Katz. Once Barack Obama and Christie had toured stricken areas and hugged victims together, “the governor — maybe the biggest surrogate for Republican candidate Mitt Romney aside from his running mate,” Paul Ryan — “goes on TV and talks about the president doing an excellent job” in aiding New Jersey after the devastating hurricane. “A year later the governor won reelection by such extraordinary margins in the state because there was a sense that he would do the right thing when the time came and put people above politics,” the reporter said. In September 2013, two months before Election Day, came the infamous “Bridgegate”: four days of major lane closures on the George Washington Bridge ordered by aides of the governor. The governor’s response: “‘You cannot be serious about that question.’” But three weeks later it was disclosed that the lanes were closed by Christie’s operatives to punish the mayor of Fort Lee for not endorsing the governor. Following Katz, Moran compared Christie’s political life to the plight of Icarus, the Greek man who created waxen wings that melted away after he flew too close to the sun. “His second term has been a disaster, and you can trace it back to Bridgegate…,” said Moran. “It was an early indication of how crazy he would get” with his endorsement of Donald Trump for president.